Drawing 1 is dated from Welbeck Street, which was Soane's home and office - the lease was purchased 30 November 1786 and the office was moved to Great Scotland Yard, Whitehall in April 1791. As Soane was making some minor alterations to pre-existing buildings in 1789 it seems likely that drawing 1 shows a chimney-piece designed to be added to one of those older parts of the Bank. 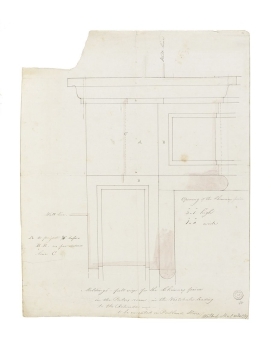 The design is very simple (compared to Soane's other chimney-piece designs) and consists of jambs and a frieze section with only incised panels to ornament them. The design may have been used as a model for many chimney-pieces in different rooms throughout the bank.